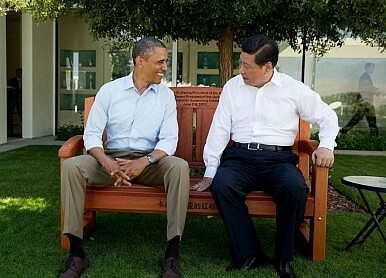 A look at recent Chinese propaganda on the bilateral relationship. As the Chinese Communist Party (CCP) General Secretary and President Xi Jinping visits the United States this week, Chinese state-run news outlets in both Chinese and English have focused their attention on U.S.-China relations in an attempt to shape the perceptions of the general public in both the United States and the People’s Republic of China (PRC) and establish a psychological conceptual framework for assessing the relationship. Chinese media propaganda is part of a larger political warfare apparatus that recognizes the power of media warfare in applying pressure to its perceived opponents to achieve its core objectives. The U.S.-China bilateral relationship is no stranger to China’s media warfare tactics. The efforts of Chinese news outlets to shape Xi’s upcoming visit through special reporting and media content have focused on U.S.-China people-to-people ties to highlight themes endorsing the unique qualities embodied in what the media portrays as a special collaborative relationship between two major powers. In line with these efforts, Xinhua conducted exclusive interviews with well-known American former officials and experts such as Henry Kissinger and many others to highlight the importance of bilateral cooperation going forward. Unsurprisingly, Chinese media is also framing the relationship through a narrative of “win-win” cooperation in a variety of areas where the two countries are at odds. The main message is that cooperation is key and all differences are, in effect, not as significant and should be overlooked as long as there are signs of goodwill. For example, China is lauding bilateral cyber security cooperation amidst ongoing negotiations despite its linkage to state-sponsored attacks against American targets such as the Office of Personnel Management (OPM), which encompassed the theft of millions of federal workers’ private information. While China has responded by touting its line of mutual cyber victimhood, framing the cyber security problem as a shared national security issue on which the two countries can cooperate, the ironic reality is that it has active units that are viciously attacking American businesses, government agencies, NGOs, and democracy and human rights defenders through cyber warfare. More excessive versions of Chinese media commentaries calling for cooperation between the United States and China have outlined a “common destiny” imperative for the two (a line previously used at other international forums). The basis of this so-called “shared future” between the two nations is placed on grounds of a “shared destiny” as global powers that have no other option than to seek mutually-beneficial cooperation out of goodwill and strategic interest to avoid the “Thucydides trap.” These broad-sweeping policy concepts fail to detail exactly what a “shared destiny” would entail and how it would work. But State Councilor Yang Jiechi’s characterization of the bilateral relationship as “making important contribution to world peace and common development” and Foreign Minister Wang Yi’s statement referring to China as “a contributor, not a ‘free-rider’” are interestingly reminiscent of past U.S. policy urging China in becoming a “responsible stakeholder” in the international community – especially in regards to the global commons of maritime, air, cyber and space. Chinese media reports of Xi’s state visit to the United States are double-thronged in purpose: to strengthen China’s own identity among domestic audiences as a credible global power; and, to shape the perceptions of bilateral relationship between the United States and China. At the invitation of U.S. President Obama, Xi’s opportunity to interact with the world’s premier economic and military power constitutes a milestone for the Chinese leader in the international community. The message is clear from the U.S. administration: not only is the White House welcoming Xi at the highest level of reception, China’s government and rule are considered credible, despite the government’s strong-armed crackdown on rights lawyers, faith groups and democracy promoters, as well as its aggressive agenda in the South China Sea. Chinese media emphasis on America’s warm welcome toward Xi sends a signal to the domestic audience in China that not only is “Xi Dada” a strong, beloved leader at home, his government’s policies and one-party communist rule are credible and respected abroad as well. The CCP’s effort to shape the bilateral relationship through media propaganda related to the trip may have somewhat backfired, however. A People’s Daily video of Americans and foreigners expressing their extreme fondness for Xi has been repeatedly ridiculed in the American press for its uncanny extravagance. While videos like this are intended to help generate public goodwill – especially needed after a recent Pew survey that revealed Americans’ negative attitudes and concerns toward China – its effect has been more negative than positive. In short, Chinese policies and actions will always speak louder than its carefully crafted media propaganda aimed at American audiences. Sabrina Tsai is a research associate at the Project 2049 Institute. All views are her own. Follow the Institute on Twitter at @Project2049 and #InfluenceOps for analysis on Chinese messaging. The Globalization of China’s Media Controls: Key Trends From 2018Amid US-China Tension, Beijing’s Propaganda Machine Kicks Into OverdriveWhat Does 'Competition' Between the United States and China Really Mean?China Is Standing in the Way of North Korea NegotiationsWhat Role Does Soft Power Play in China-US Relations?